The Dubai Sand Witch: What's a witch got to do to get a drink around here? What's a witch got to do to get a drink around here? The short answer to this is one mounts one's broomstick and goes to a bar. Actually, if one has any alcohol at all in one's blood and one is in charge of a broomstick, one gets burnt at the stake. OK, that's a slight lie, one goes to prison, but I like to stretch the witch metaphor when ever I can. In conclusion, it's best to get a taxi if you're going for beverages or nominate a designated driver. But if you need alcohol for consumption at home and you are not yet in possession of a booze licence like the Sand household, you have to make the 54-mile drive to Ras al-Khaimah where there are alcohol shops that will sell you booze without a licence. Legally, I might add, as the laws are different in the northern Emirate of RAK. You're probably wondering why we, as a booze selling family, do not have an alcohol licence. Well, the answer to that is that we were living in what was technically an illegal sub-let before we came to our current Bedouin tent, (ok, ok, it's a flat, but I like to preserve the illusion of Arab life) and you have to produce a tenancy agreement to show where you're living to apply for a booze licence, and obviously, we were not on the tenancy agreement. The reason we were in an illegal sub-let was partly because our housemate couldn't be naffed to put us on the agreement and partly because it's technically illegal for people who are not related to each other or married to live together. The law was brought in to stop over crowding and to crack down on large groups of young professionals who were sharing villas in posh areas and annoying the locals with noisy parties and general debauchery. Many things are "technically" illegal in Dubai as you've probably gathered but the way to get away with them is to do them without annoying the locals. I think it's fair to say that co-habiting and flatsharing in Dubai is nearly as widespread as it ever was. Another "technically" is that if we were stopped by police on the way back from RAK to Dubai in the middle Emirate of Saudi-Arabian sponsored Sharjah, which is completely alcohol free (supposedly) they would have the power to confiscate all our booze and pour it out on the ground in front of us. A bit like being caught by police boozing on a park when you're 15 but considerably more expensive. What a strange place I live in. This didn't happen thankfully as the Sand Warlock assures me that the reason the booze shops in RAK are able to exist is from people coming from other Emirates who haven't got their licences. Anyway, our booze licence application is under way but we recently found that our stocks of what the Sand Warlock calls "drinking wine" (ie wine that I'm allowed to knock back like lemonade while I'm stirring the spaghetti bolognese of an evening, not the posh stuff that's meant to actually be tasted) were depleted. It got to the point where we were drinking vodka and tonic with our evening meal. Most uncivilised. So, we mounted the tandem broomstick, ok, I'll stop it now, we got in Kevin the Toyota, and went off to Ras al-Khaimah. There's a particularly fine store there called the Al Hamra Cellar. I have to admit some bias as it's owned by the same company that the Sand Warlock works for. From the outside, it looks like an American liquor store and has a security guard posted on the gate. Inside, it's a bit like coming home to the wine section at Waitrose. Most reassuring. 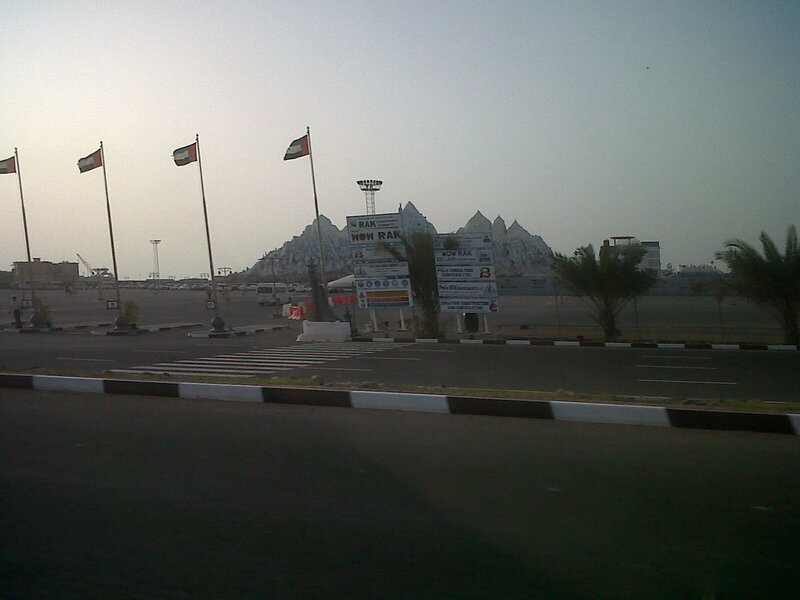 The drive to get to the Emirate of RAK is very typical of the UAE. Huge, six-lane motorways cutting through the desert with the occasional mega-sized billboard advertising a once planned but now forgotten housing development or huge poster of a Sheikh. Like all trips north towards Oman, you can see the sand getting gradually more orange-coloured as you move towards the mountains. Unfortunately, I didn't take a camera but I did get some blurry shots using my phone camera. 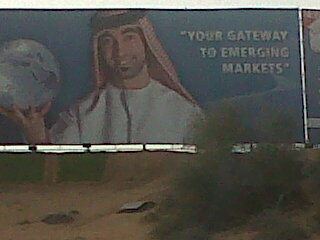 This bloke looks a bit like the Crown Prince of RAK. I don't think it is him but the picture tickled me anyway. Then there's this one, a rather dilapidated looking water park called Ice Land or something similar. 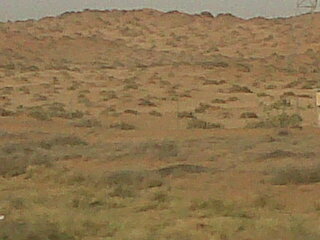 It's the desert seen from Kevin the Toyota! OK, it's a bit blurry but I like the fact that you can pick out the orangeness of the sands and that as you can see, parts of the desert are actually pretty green with various bits of scrub. The town of RAK is quite a diverting place to be. The outer edges of it feel a bit Wild West which I think is a common factor of many desert towns. There are long rows of slightly dodgy looking shops and restaurants set back from the road. One in particular, Al-Jazeera Refrigerators, caught my eye, as it appeared to be selling appliances that last saw active service in the 1970s. I'm pretty certain that's where the landlord got the pre-historic fridge-freezer that resides in our kitchen. These town outskirts always remind me of the scenes in Star Wars when Obi Wan and Qui-Gon go to find the young Anikan and recruit him to become a Jedi. Obviously there aren't many flying aliens hovering about but there's something about the heat and dust and the need to barter. The finally "technically" in this post is the fact that it's "technically" illegal for Muslims to buy alcohol in the Emirates. However, you will usually see at least one bloke in national dress, who is therefore very likely to be a local and a Muslim, drinking alcohol when you go into a bar. The fact that they don't even bother putting on Western clothes to drink shows how little regard they have for that law. They don't, as A A Gill claimed in his article on Dubai that so upset the magazine distributors here that they tore it out of Vanity Fair before selling it, even bother slipping into Western clothes, even though the bar owner could "technically" lose their licence for serving them.